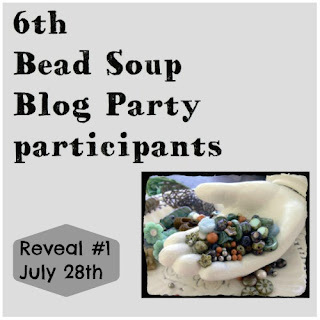 So what is the Bead Soup Blog Party? It's a huge blog hop and beading challenge that has grown into so much more than I ever expected. 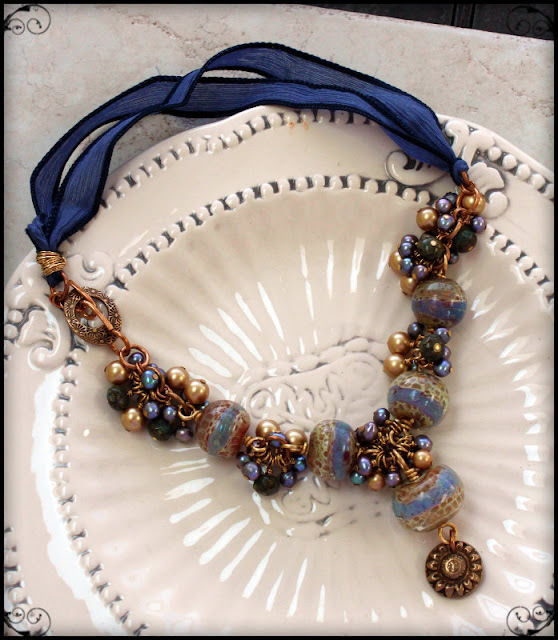 There's now a Facebook group for bead and jewelry designers and this October, a book! To say I'm honored by everyone's participation is a supreme understatement (click here to see the maps!). As with all my BSBP reveals, this is long, but I hope it's worth it! 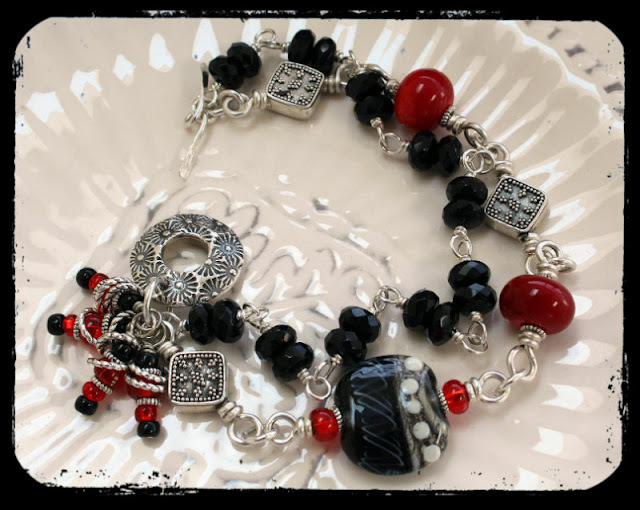 Grab a cup of your favorite beverage and experience my pit falls, ah-ha moments, and be sure to visit the links to the many talented bead artists my partner sent me! After the giddiness wore off, I thought I knew EXACTLY what I wanted to do, and even ordered some extra beads for my plan. But as best laid plans often do, the plan changed. I knew the blue Bead Soup would be my easiest, so I started on the black, red, and white one first. 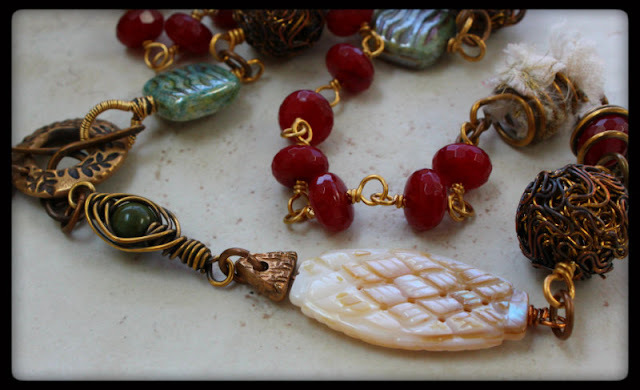 I knew I didn't want to mix Donna Millard's lampwork with Marsha Neal's focal, and that focal was my first stumbling point. 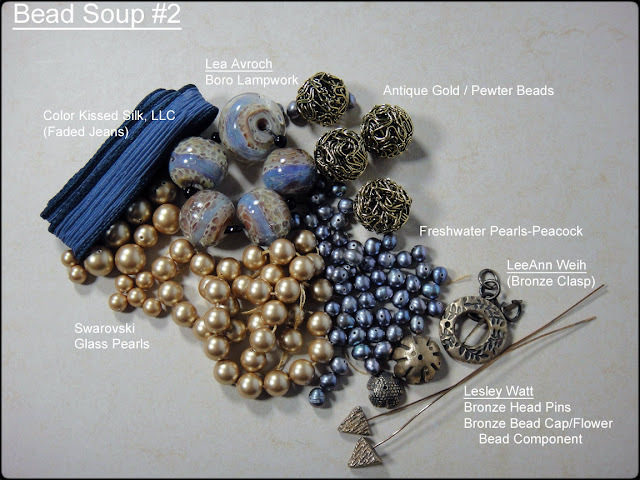 I sat there at the table, beads everywhere, and idly picked up a bronze headpin, bronze bead cap by Lesley Watt, and a gold Swarovski crystal pearl from Bead Soup #2. And guess what? Brilliant. I sat with the pendant for a few days and tried to figure out what else to do. 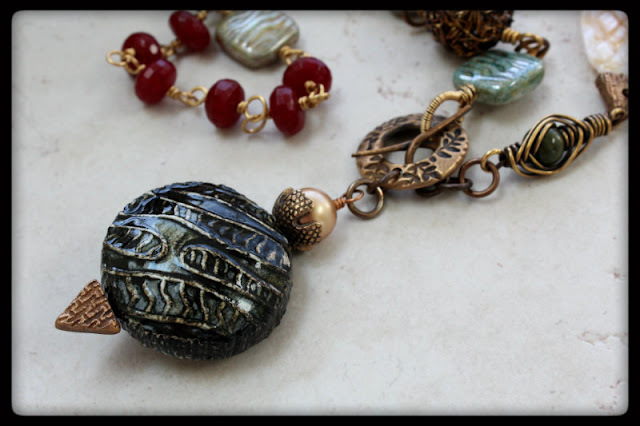 I ended up mixing part of Bead Soup #1 with Bead Soup #2 -- the clasp by Leann Weih became the focal ABOVE the focal, and I pulled out my newest favorite, bronze wire from Objects and Elements, to wrap around an olive green Lucite bead from my own stash. I also wrapped the link that goes through the clasp with 22-gauge wire for a more substantial and interesting link. I had bought that wonderful mother of pearl bead at the Bead and Button Show this year and it seemed destined for this piece -- but for some reason, I HAD to use the extra headpin and decided to drill a hole in it to make a link to the (poorly) wrapped Lucite bead. And remember the gold tangle beads in Soup #2? They were too bright for this necklace, so I did a QUICK dunk in Jax Brown, praying I wasn't going to ruin them. 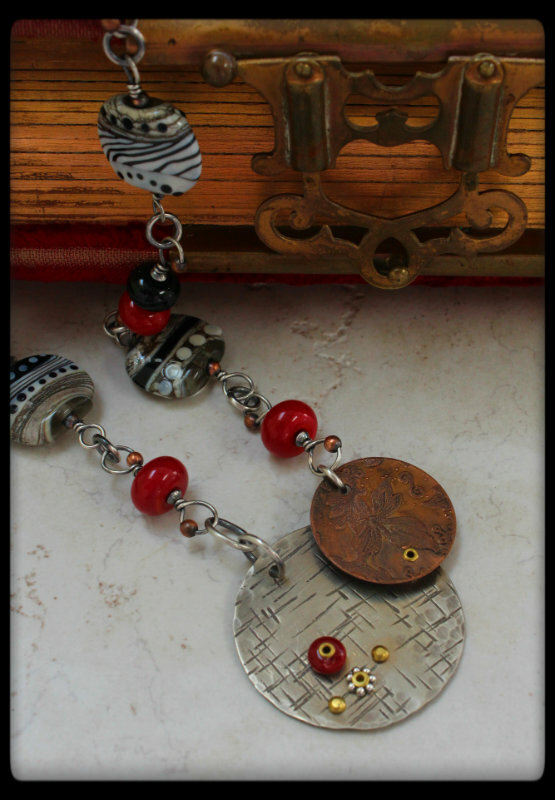 I left them in a rustic state because that seemed to work for this necklace. 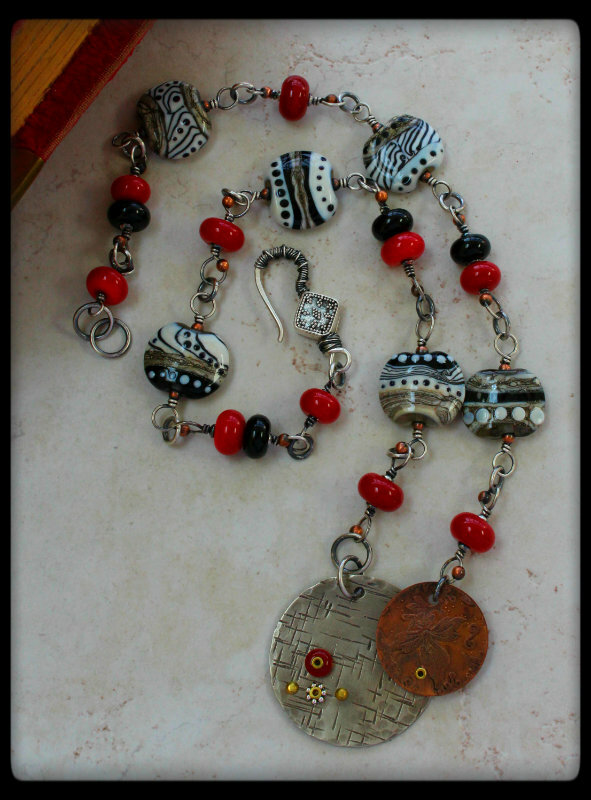 I wanted to add some color to the necklace, so used multi-faceted dyed red jade from LimaBeads from my stash and square Czech glass beads, also from my stash. 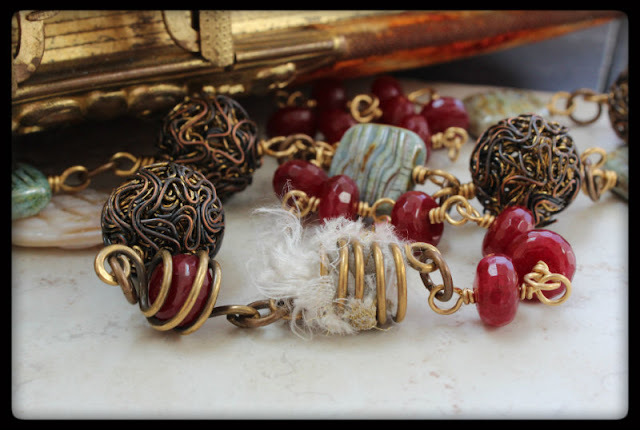 I made a couple of bronze wire cages and stuffed one with white sari silk and captured a jade bead in the other. 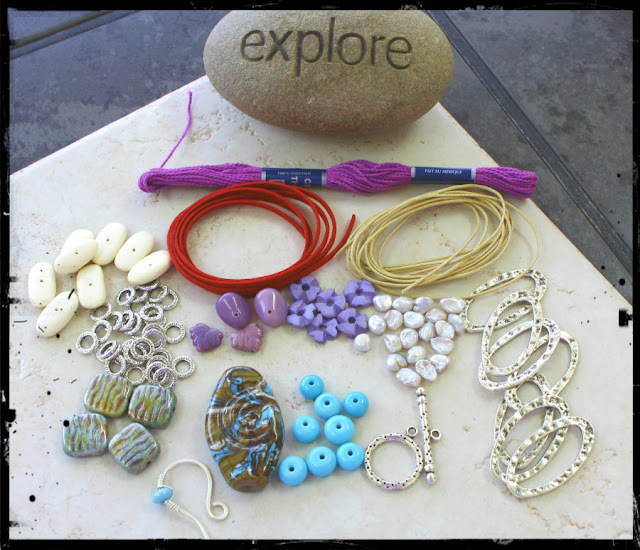 I've been super-interested in texture in jewelry lately, so that's what drove the decision. NOT the best photo, but it was 105 degrees outside when I took it and that just had to be that! 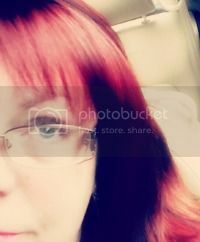 I'm rather fond of this. So that was the first piece, and it made me feel I could actually DO something! 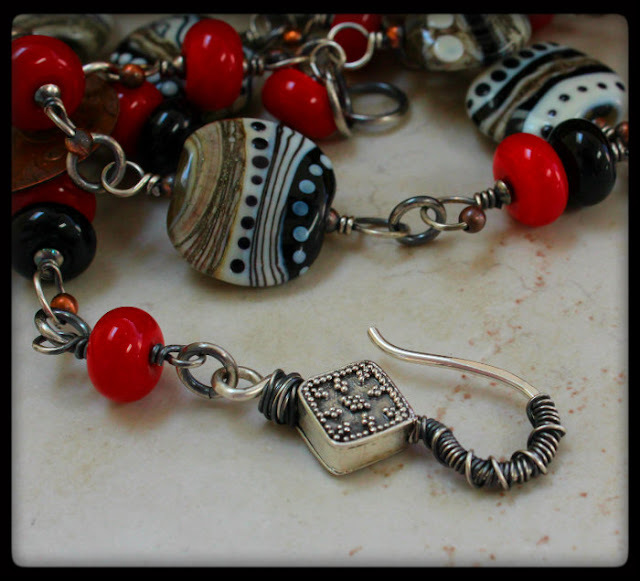 On to the second piece, with Donna Millard's distinctively patterned lampwork beads. 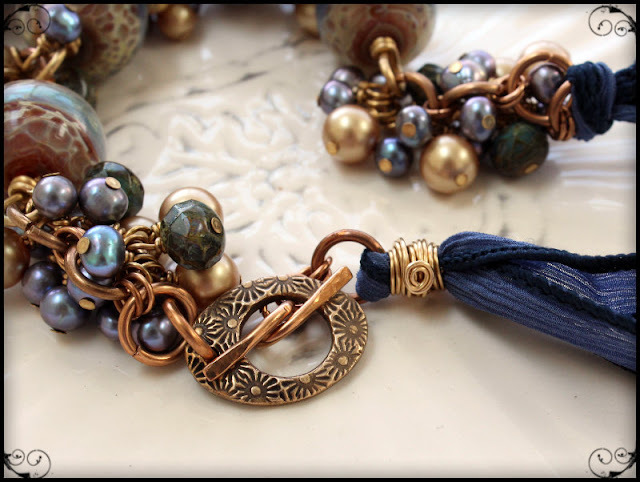 When working with beads that have a strong pattern, it's important to let the beads do the talking and not have too many other conversations going on in the background. I made a pendant for this one with a piece of etched copper from an old project (I save EVERYTHING) and a larger piece of nickle silver. I stacked a few metal spacers between the two pieces for depth, and riveted some random things in. The funny thing? I made this pendant a month before my soup arrived, yet it's perfect with those red beads! I decorated the links of the red lampwork bead links with tiny copper beads... see them up there? 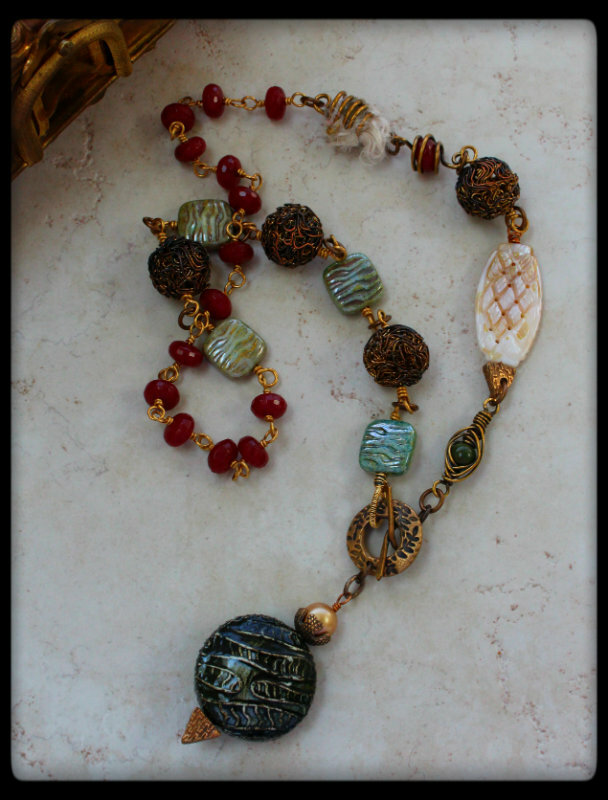 Then I let the beads do the talking and made a simple linked necklace. 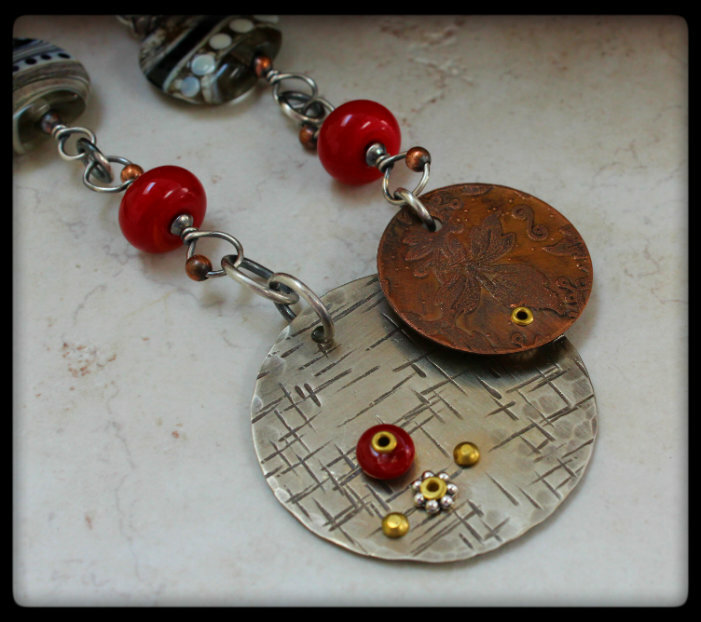 I hope the relative simplicity and modernity of the pendant worked well with Donna's lampwork. What do you think? 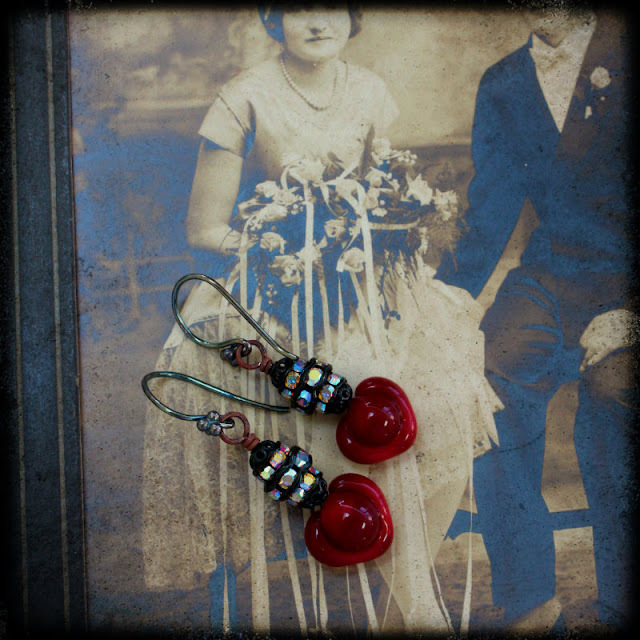 And the second set is made with some vintage rhinestone beads and photographed against my first wedding cabinet card (I collect cabinet cards, but never had a wedding one!). It seemed fitting. So that took care of Bead Soup #1 and part of #2! 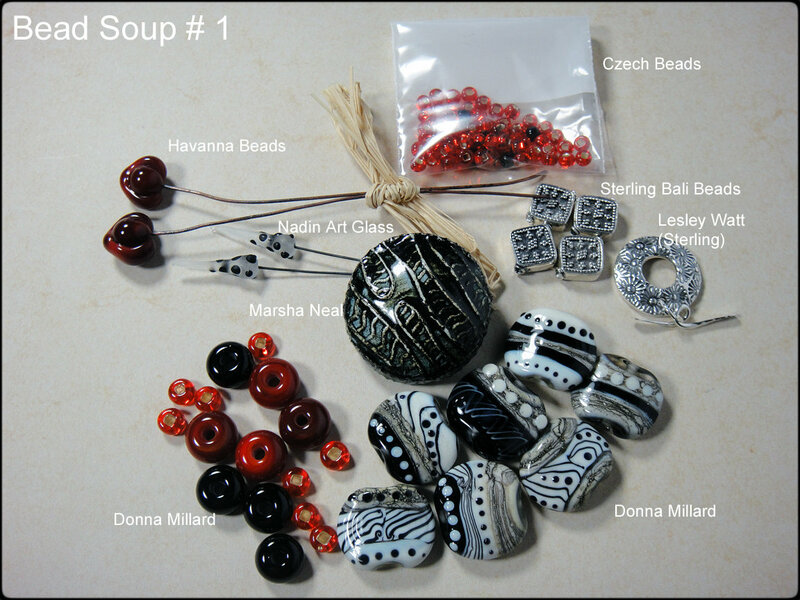 The second soup, the blue soup, I was giddy over because I LOVE fat, chubby lampwork beads. 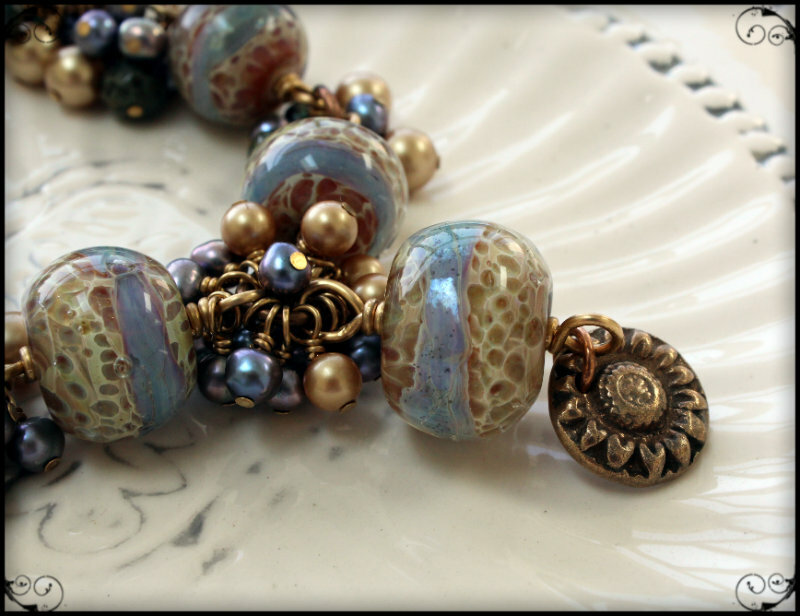 These are gorgeous substantial beads made by Lea Avroch. I also love blue, and really need a blue necklace. 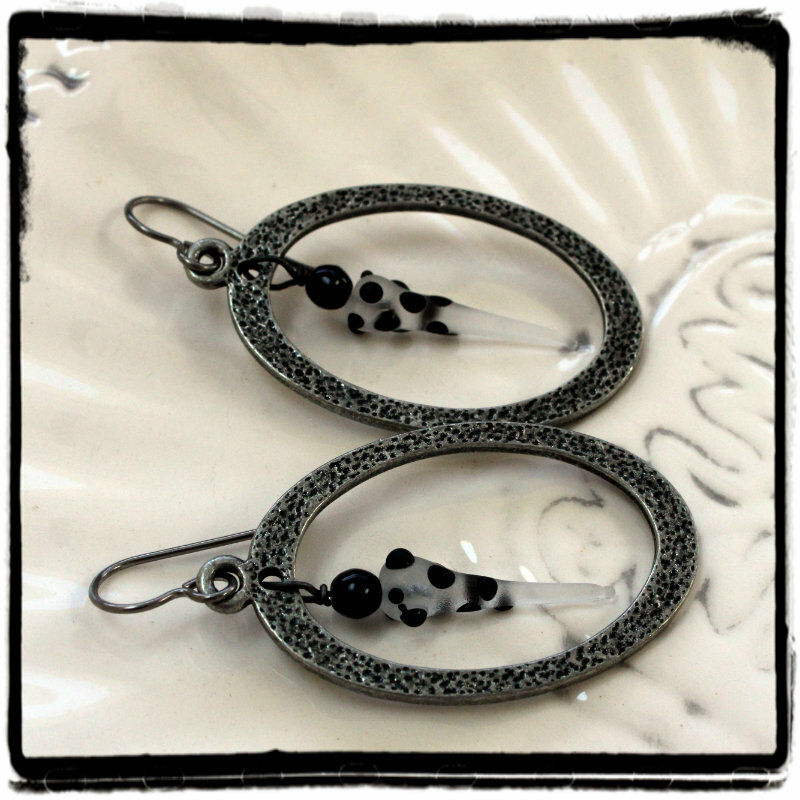 I knew I wanted to incorporate my favorite things (dangles!) but I really wanted it LUSH. I happened to have a charm by Lesley Watt arrive on my doorstep a couple of days before I started work on the necklace, and since I'd already used the bronze clasp in the earlier necklace, I found another toggle from Lesley and went to town. And the final piece, which took about three hours of intense wire wrapping. I managed to use almost everything Patti sent me. I only had a few red seed beads, six cultured pearls, a bead cap, and a few Swarovski crystal pearls left over, and I think that's all! 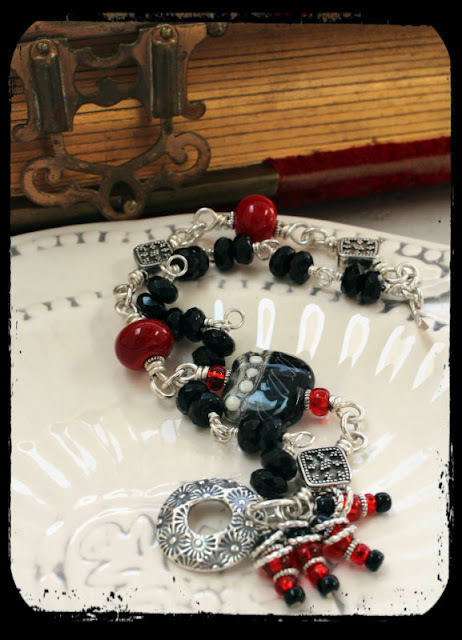 Here's what I sent to Patti, and you can click here to see what SHE made! And the rest of the BSBP6 Reveal #1 participants! Next reveal date -- August 11th! Where do the BSBP6 participants live? I can't believe it's almost that time! 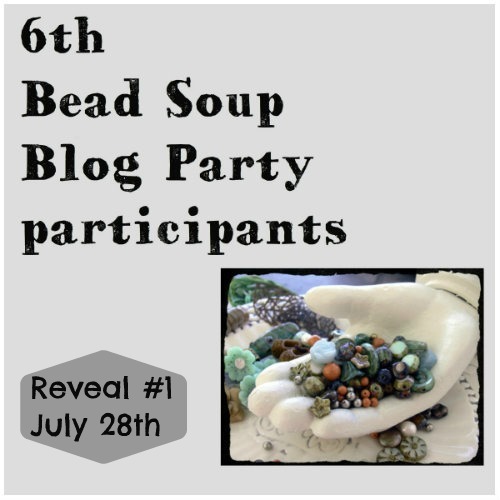 The 6th Bead Soup Blog Party®, Reveal #1, will be this Saturday!!!! 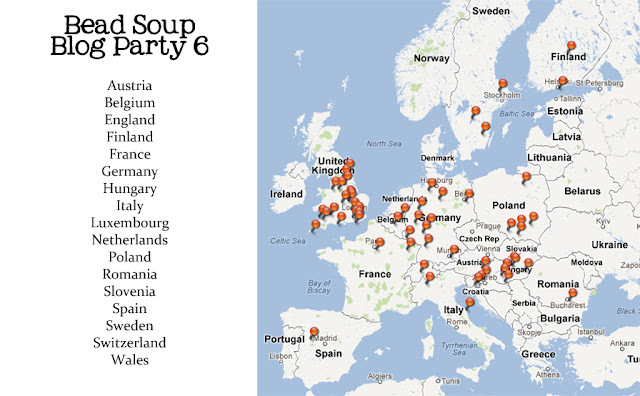 So without further ado, here is the entire party, all three reveals, mapped out for you. Click on the maps to get a larger view! 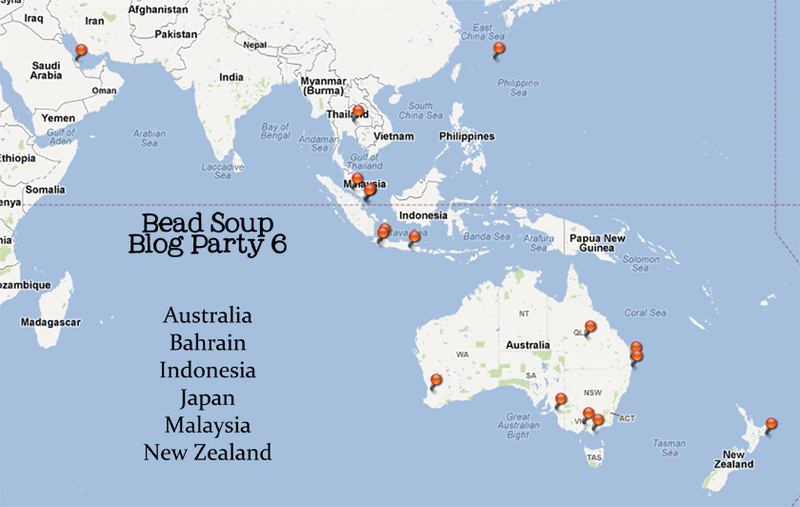 It never ceases to amaze me how this blog hop keeps growing and expanding. Each party, we gain new people, but what does that mean? It's not just about numbers. Numbers alone don't make a blog hop. No, what makes the numbers meaningful is they're assigned to PEOPLE, and each person who joins in the fun opens their world a little more. 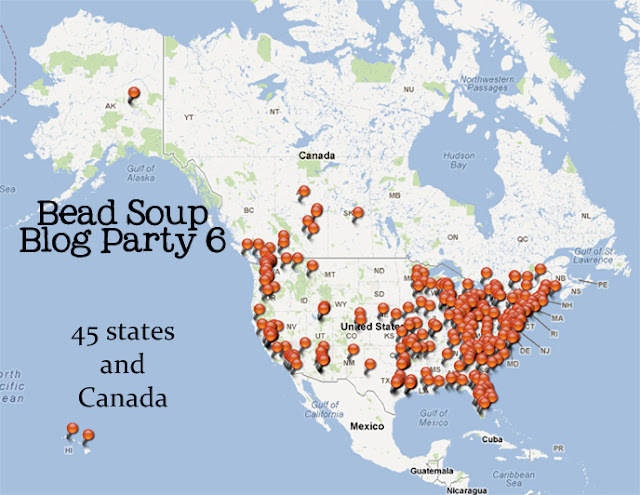 Not only is everyone expanding their design horizons, they're expanding their network of friends and colleagues -- especially since the Bead Soup Cafe opened its doors on Facebook and took the BSBP from an event to a community. I'm so excited to see what the first reveal group makes!!! !